Yeats is Dead (2001) is a best-selling crime novel with a difference: each of its 15 chapters was written by a different Irish writer. Edited by Joseph O'Connor - who also contributed one of the chapters - the book raised hundreds of thousands of euro for Amnesty International, with the writers' royalties going to support human rights education. 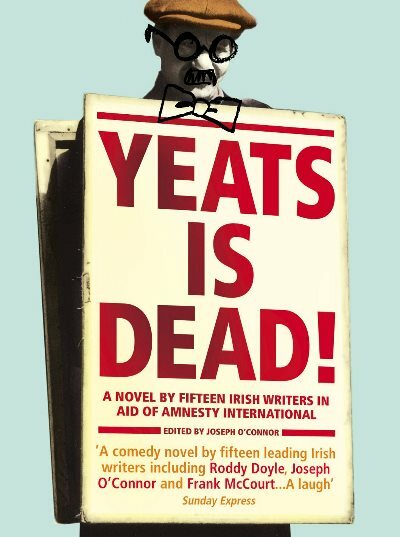 The authors included Roddy Doyle, Conor McPherson, Gene Kerrigan, Gina Moxley, Marian Keyes, Anthony Cronin, Hugo Hamilton, Owen O'Neill, Tom Humphries, Pauline McLynn, Charlie O'Neill, Donal O'Kelly, Gerry Stembridge and Frank McCourt. Writing in the Guardian, Emma Brockes said that the collaboration was worth reading "for the fun-factor of watching the last three authors scramble to pull 15 storylines together; for the blatant squeamishness of the first six authors, who would rather slay the entire cast list than take up second-hand characters; and for the sense of enjoyment that infuses the thing from start to finish". Yeats is Dead was possibly one of the earliest Irish crime novels written in this way, as a relay of authors picking up the story in the next chapter. Similarly, Peter Cunningham devised and edited the murder mystery Sister Caravaggio (2004), featuring chapters by himself, Maeve Binchy, Neil Donnelly, Cormac Millar, Éilís Ní Dhuibhne, Mary O'Donnell and Peter Sheridan. And Dermot Bolger brought together six Irish authors for Finbar's Hotel (1999), a set of loosely related short stories, though not necessarily in the crime genre. Each story focused on one of the occupants in the various rooms of a seedy Dublin hotel. A follow-up was Ladies' Night at Finbar's Hotel (1999), this time featuring an all female line-up of writers.